I have new respect for Project Runway contestants. A whole day to make a dress? That doesn't sound too hard, I'd always thought. It's not like they need to feed the kids, do the washing, and clean their fabric off the kitchen table afterwards. But, this one little baby dress has had me up at night poring over the instructions, has had me in tears of frustration when I thought I'd sewn the armholes closed, and in tears of joy when I realised I'd actually done it right and wouldn't have to chop Tilly's arms off to fit her into it. So far, the top of the dress is done, complete with ruffles, and I'm just trying to work out how to sew buttonholes so I can proceed with the undergarments. Any tips? On second thought, maybe it's good as it is -- it can be her belly-dancing shirt. In case you're wondering, the pattern is by Fiona Bell, of British kids' label Their Nibs. 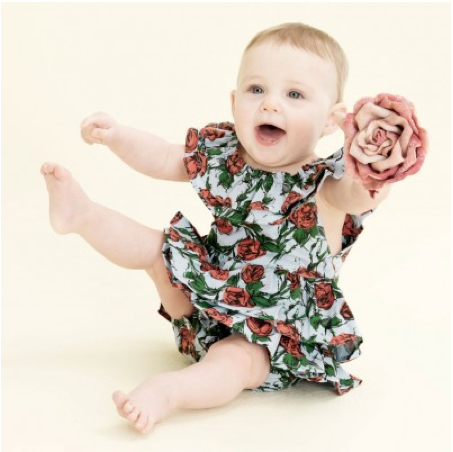 Here is the same dress in a lovely rose print in their online shop, (going for 28 pounds, if I might add). Beautiful. This link might help with your button hole problem. Dress is looking very cute so far!